The illustrations show the main places to check when you've got a leaking fridge. All the water comes from melted condensate which is normally carried away through either 1) a drip cup and tube combination or 2) through a drain hole in the bottom of the fridge (photo 3). Your fridge will have one system or the other, not both. The problem always comes down to finding the blockage and clearing it. Sometimes, you'll find ice in the drip cup. Sometimes, you'll find lots of interesting biological growth in the drain hole. Clean it out and you're good to go. 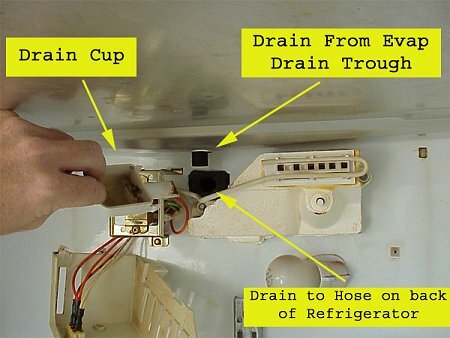 The photo below shows the most common leak locations for Whirlpool (and most Kenmore) refrigerators. 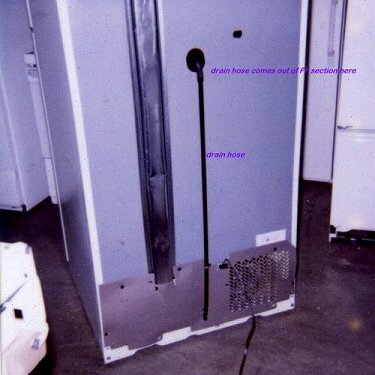 If you can't find the drip cup inside the fridge, you can usually locate the condensate tube on the back outside of the fridge pretty easily. The photo below shows a typical example on a GE fridge. 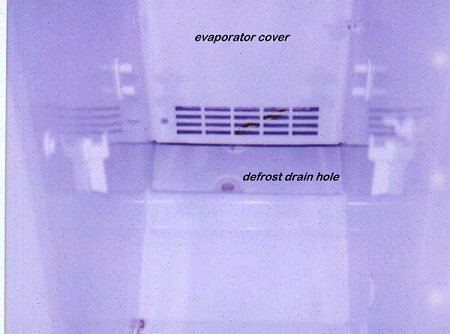 On many side by side refrigerators, the condensate is conveyed out a drip hole in the bottom of the freezer, as shown below. To learn more about refrigerators/freezers or to order parts, click here.